The way the ATO collects a tax debt differs depending on whether the taxpayer is an individual or a company. The first few steps are generally the same – phone calls, letters, perhaps a garnishee notice. For a company, the ATO may also issue a Director Penalty Notice to the directors, making them personally liable for unpaid PAYG withholding and superannuation. The longer a debt goes unpaid, the more likely the ATO is to escalate its debt collection beyond these measures and take legal action through the courts. For a company debt, the first step in the legal action will be for the ATO to prepare a statutory demand under section 459E of the Corporations Act (also known as a Form 509H). Here’s an example of the first page of a statutory demand. There should also be some attachments to the statutory demand. These should be a list that details the company’s debt and an affidavit from an ATO officer about how they gathered the information about the debt. delivering a copy of it personally to a director who lives in Australia. This can be a bit of a trap. A company’s registered office is the address that is on the ASIC register. Quite often, I see situations where a company may have moved, and told the ATO about the new address but not updated the ASIC register. When the ATO sends the statutory demand to the company, it has to send it to the ASIC registered office – this is a specific requirement of the law that governs companies. It doesn’t matter if the ATO has a different address on file for the company. If you haven’t updated your company’s registered office on the ASIC register, then you may never receive the statutory demand. This can cause problems for the company down the track. try to convince the ATO to withdraw the statutory demand. If the company doesn’t successfully do one of these things within 21 days, then it is presumed to be insolvent. Usually, if a tax debt has gotten to the point where the ATO has issued a statutory demand, the company does not have the money to pay the debt in full. This means that a payment plan is often the best bet for dealing with the statutory demand. You can use the Hartigan Law Payment Plan Calculator to help you work out what sort of offer you could make to the ATO. The ATO will use this information to assess what sort of payments the company can realistically afford and whether the proposed plan is suitable. The ATO wants to see the debt paid off in the shortest time possible. If it looks like it will take the company several years to pay off the debt, then it will be very hard to negotiate a plan. The ATO may be willing to grant a longer than usual payment plan if you are able to offer security over an asset. For example, if the company owns the building from which it operates, the ATO may be willing to take a first or second mortgage over it to secure the payment of the debt. Another way to deal with a statutory demand is to apply to set it aside. Usually, you would only do this if you thought you had a good basis for your application. This is because there are court costs associated with making this application. Also, you can be ordered to pay the ATO’s costs relating to the court action if you lose. An example of a basis for making an application to set aside a statutory demand is if there is a serious defect in the document. To be successful on this ground, the defect must be so serious that it would cause ‘substantial injustice’ if it were not set aside. This can be quite a high bar to reach. 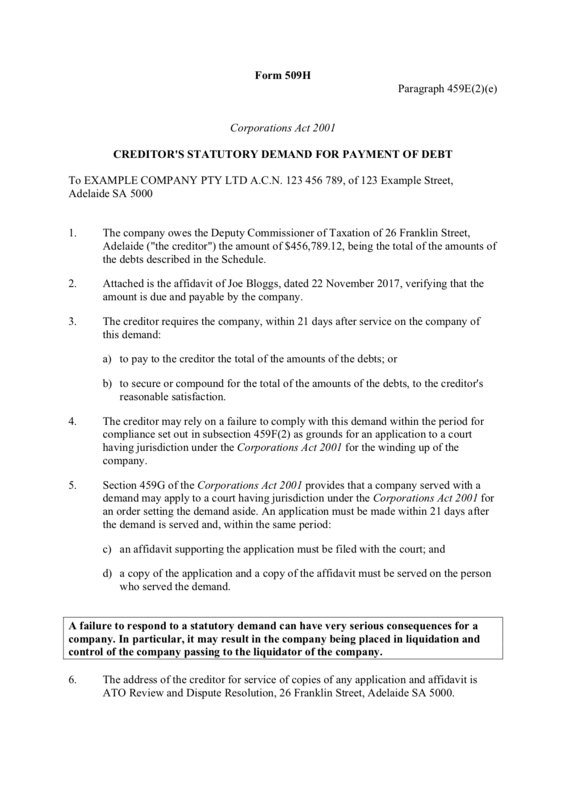 Another option that companies usually have for applying to set aside a statutory demand is when there is a genuine dispute about the debt. Unfortunately, this option is much more difficult when it comes to statutory demands issued by the ATO. This is because most tax debts have a special status; the tax law says that the very fact that an assessment has been issued is ‘conclusive evidence’ that the debt is owed. This rule applies to most tax debts. There may be something wrong with the statutory demand that would justify the ATO withdrawing it. For example, the ATO may have sent it to the wrong address, it may include incorrect amounts, or there may be some other procedural error which means that it shouldn’t have been issued in the first place. An experienced tax lawyer should be able to review the statutory demand and the circumstances carefully and find these issues. They should then be able to bring these issues to the ATO’s attention and get a quick response about whether the statutory demand will be withdrawn. If you can convince the ATO to withdraw the statutory demand, then great – you’ve just saved yourself a lot of time and headaches. If the ATO doesn’t withdraw the statutory demand but you still believe there’s a defect, then you need to apply to set aside the statutory demand within the 21 day period. This is why the review of the statutory demand and then communication with the ATO must be done as early as possible. You need to make sure you have the time to negotiate and still execute your plan if you can’t reach an agreement with the ATO. If you’re not able to do any of the above within 21 days, then the ATO can apply to wind up the company. The ATO must do this within 3 months of the 21 day period expiring. This means that, even if the 21 day period has ended, you can still try to negotiate with the ATO. If the ATO decides to make the application for winding up, it can be very difficult to save the company. This is because there is a presumption that the company is insolvent, which allows the court to make the winding-up order. If you want to try and save the company at this stage, then you should seek some advice from an expert about your options. are the directors exposed to personal liability for tax debts? does the company agree that the ATO has correctly calculated the tax debt? If not, should it lodge an objection? is there an opportunity to reduce the tax debt, for example through a request for a remission of the general interest charge? When I help companies that have received a statutory demand, the answer is usually “yes” to at least one of the above questions. This is why expert advice is so important. The issues exposed by a statutory demand are usually quite complicated and you need the right expertise to be able to address them. 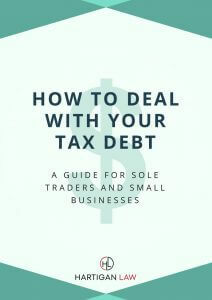 I’ve helped many clients to sort out their tax debt, even after the ATO has started legal action. For an example of this, you can read a case study about my client George, who I was able to save from the brink of bankruptcy. I work with clients all over Australia. I can do this because the tax issues I deal with are Federal – the law is the same no matter where in Australia you live. However, I only appear in courts in Adelaide, so I may not be able to help if you have a court matter in a different city.